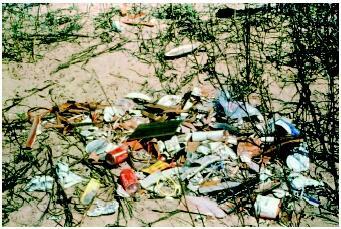 Marine pollution is the release of by-products of human activity that cause harm to natural marine ecosystems. The pollutants may be sewage, farm waste, toxic chemicals, or inert materials that may smother, choke, or strangle living organisms. Sewage, animal waste, and chemical fertilizers all have a high content of nitrogen and phosphorus. Artificially high levels of these substances in the water promote excessive growth of microscopic or macroscopic plants, in a process called eutrophication . When these plants accumulate, die, and decay, they cause low oxygen content in the water. Even if sewage is treated to remove solids, the liquid discharged contains high levels of nitrogen and phosphorus. Intensive cultivation of animals in feedlots, or application of more fertilizer than a crop can absorb, also cause runoff rich in nitrogen and phosphorus that find their way into rivers and estuaries. Vehicle exhausts and industrial chimneys are large sources of nitrogen compounds that are transported in the atmosphere and deposited in coastal waters. On a global scale, agricultural runoff is the most important source of eutrophication, but atmospheric deposition is the fastest-growing source. It is the largest source of nitrogen off the coast of the northeastern United States, in the western Baltic Sea, and in the western Mediterranean Sea. International agencies consider that, worldwide, eutrophication is the most serious pollution problem in coastal waters. For example, in the Gulf of Mexico, off the mouth of the Mississippi River, water near the bottom has severely reduced oxygen content over a very large area, sixteen thousand square kilometers (6,200 square miles) by 1998. Mobile animals such as fish and shrimp leave the hypoxic area, but sedentary animals such as clams and worms are killed in large numbers. A classic example of eutrophication and its treatment occurred in the estuary of the River Thames, near London, England. In the 1950s the water was severely hypoxic for thirty-five kilometers (twenty-two miles) below London Bridge. After several sewage treatment plants were built, the water returned to a well-oxygenated state and migratory fish such as salmon once again ascend the river. In the case of the Mississippi River, treatment of the eutrophication is more difficult because runoff from agricultural land is the major cause of the problem, and more than half of the agricultural land in the United States drains into the Mississippi basin. Cleaning up the pollution would involve changes in farming methods on a national scale. Eutrophication has important indirect effects. The plants known as sea grasses, which grow in the shallow water of estuaries , provide food and shelter for a wide range of animals, including geese, turtles, manatees, and fish. In eutrophicated water, the dense microscopic plant life significantly reduces the penetration of light and smothers the sea grasses. In Chesapeake Bay, Maryland, eutrophication caused an area of sea grasses to decrease by twothirds between 1960 and 1980, and there was a corresponding decrease in landings of fish and crabs. Similar effects have been observed in Australia. S. Barnett, United States Environmental Protection Agency. Reproduced by permission. and become so abundant that the water is discolored. Many bloom species produce toxic substances. During the 1990s in estuaries located in the southeastern United States, there were numerous cases of blooms of Pfiesteria piscida, a dinoflagellate that produced a toxin which killed thousands of fish. The source of the nutrients support Pfiesteria is believed to be agricultural runoff or sewage discharge. Other types of blooms are ingested by shellfish, which become toxic for humans who consume them, causing partial paralysis, memory loss, or even death. Toxic blooms have been reported much more frequently in the 1990s than in the past, and the spread of eutrophication is believed to be a contributing factor. On coral reefs, eutrophication causes seaweed to grow and smother the corals. Several kinds of environmental problems interact with eutrophication to cause the deterioration of coral reefs. Overharvesting of the fish and invertebrates that eat seaweed accelerates the smothering. Careless development along coastlines and in river basins leads to soil erosion and the transport of heavy loads of silt and clay, which settle on the corals and smother them. Oil spills also take their toll. When corals are exposed to abnormally high water temperature, they respond by discharging the microscopic algae living within their tissues. Sometimes they recover, but often they die. These episodes, called coral bleaching, became much more frequent during the 1990s and are believed to be caused by global warming. The result of pollution and global warming is that at least half of the area of coral reefs in southeast Asia is in poor condition, and in parts of the Caribbean Sea only 5 percent of the reef area consists of living coral. Industrial effluents often contain metallic compounds. For example, Halifax, a small city in eastern Canada, discharged into its harbor during the 1990s about thirty-three tons of zinc and thirty-one tons of lead per year, with lesser amounts of copper and other metals. These metals are held in the sediment in a relatively inert form, but if stirred up into the water column, they become oxygenated and toxic. Tin is another common pollutant in harbors. It occurs as tributyltin (TBT), which is used as a component of antifouling paints on the undersides of ships. When taken up by shellfish, it accumulates in their tissues and has proved toxic to the shellfish and to organisms that consume them. The United States began to phase out TBT in 1988, and it will be banned internationally beginning in 2008. Industry also produces organic compounds such as polychlorinated biphenyls (PCBs) and various pesticides. These accumulate in the fatty tissue of plants and animals low in the food chain, and as they pass through the food web to larger and long-lived animals, there is an increase in concentration of the substances in their fat, a process known as bioaccumulation. The St. Lawrence River, which drains the Great Lakes, has accumulated large amounts of organochlorines , which have amassed in the tissues of Beluga whales. During the 1990s, the level of this pollution was much reduced, and the whales have been protected from hunting, but their population fails to increase. Many animals have tumors and disease. There is mounting evidence that chronic exposure to contaminants causes suppression of the immune responses of marine mammals. Similar problems have occurred with seals in the Baltic Sea. The most serious types of oil pollution occur when an oil tanker goes ashore or hits a reef and spills its contents. As the oil drifts ashore, great damage is done to beaches, rocky shores, salt marshes, or mangrove forests. Cleanup is often attempted using mechanical means, or the application of dispersants, with mixed results. Usually, a proportion of native organisms are killed, but given time, the lighter fractions of oil evaporate, while the heavier fractions are decomposed by photochemical processes and microorganisms. International law now requires that vessel owners be responsible for any loss of oil, damage to existing ecosystems, and the costs of recommended cleanup. Chronic low levels of oil pollution, resulting from accidental spills when loading or unloading, or from washing out oil tanks, are widespread and of significant concern. For example, it has been determined that corals around an oil terminal in the Red Sea have experienced lower growth rates and poor reproduction as a result of chronic low-level oil pollution. Oil pollution of the open ocean is also a major concern. When Thor Heyerdahl crossed the South Pacific on the raft Kon-Tiki in 1947 he reported pristine waters, but his Ra expedition across the Atlantic twenty-two years later encountered oil slicks on forty-three of fifty-seven days at sea. The International Convention for Prevention of Pollution from Ships was devised in 1973 and modified by the Protocol of 1978. Oceangoing vessels are subject to strict regulations concerning the discharge of oil, bilge water, and ballast water, and are forbidden to dump garbage and other solid waste. Accidental spills must be reported. Marine beaches serve as natural traps for marine debris. Globally, the most common materials are plastics, followed by glass and metal. The chief dangers to marine life result from the ingestion of these fragments, which may block the gut, and from entangling, which may cause suffocation or prevent locomotion and feeding. In a survey of U.S. beaches close to urban centers, cigarette butts were the most abundant debris, followed by packaging items (boxes, bags, caps, lids), medical waste, and sewage. A high proportion of this material reached the sea by way of sewers. Even street litter can be washed into surface drains and then to the sea. The dumping of sewage and waste by ships is another source. Public revulsion at the state of U.S. beaches was a key factor in the enactment of stronger environmental protection laws, like the Ocean Dumping Ban Act of 1988 that prohibited the dumping of sewage into the ocean. On sites more remote from cities, pieces of rope and netting are the most common types of marine debris. There is much that individuals can do to prevent marine pollution: avoid putting toxic substances into drains, avoid dropping litter, minimize the use of pesticides and fertilizers, reduce automobile emissions, and pressure your local government for sewage treatment in the community if it does not yet exist. Larger-scale problems require legislation and enforcement, ranging from the local laws of coastal states in the United States, through national laws such as the Clean Water Act and Clean Air Act, to international conventions such as the International Convention for the Prevention of Pollution from Ships. Such laws are effective only if they have the support of the people. SEE ALSO A CID R AIN ; C LEAN W ATER A CT ; C RYPTOSPORIDIOSIS ; F ISH K ILLS ; H YPOXIA ; M ERCURY ; O CEAN D UMPING ; PCBs (P OLYCHLORINATED B IPHENYLS) ; P ETROLEUM ; R IVERS AND H ARBORS A PPROPRIATIONS A CT ; S NOW, J OHN ; W ATER T REATMENT ; W ASTEWATER T REATMENT . Clark, R.B. ; Frid, C; and Attrill, M. (2001). Marine Pollution, 5th edition. Oxford, UK: Oxford University Press. Pelley, J. (1998). "Is Coastal Eutrophication out of Control?" Environmental Science and Technology 32:462A–466A. Global Investigation of Pollution in the Marine Environment (GIPME). "Marine Pollution Programme." Available from http://ioc.unesco.org/iocweb . Ocean Conservancy. Available from http://www.oceanconservancy.org . Coral grows a new layer each year, much as a tree adds a new ring each year. Scientists analyzing layers of Bermudan coral have discovered an environmental record dating back to the mid-1800s. Marine pollution can be measured across the Industrial Revolution. Marine levels of lead have dropped dramatically since the phaseout of leaded gasoline but levels of lead in the Atlantic are still double their preindustrial concentrations. When Thor Heyerdahl, a Norwegian biologist (1914–2002), sailed the balsa wood raft named Kon-Tiki, from Peru to Polynesia in 1947, he saw no pollution in the Pacific Ocean. Just over twenty years later, in 1970, when sailing a papyrus reed boat from Morocco to Barbados, Heyerdahl saw extensive marine pollution including oily wastes, plastic bottles and other trash floating in the water. He radioed the United Nations to report that floating lumps of solidified, asphalt-like oil polluted over one thousand miles of the Atlantic Ocean. After seeing the extent of the ocean's pollution first hand, Heyerdahl became actively involved in fighting marine pollution. In 1999, with the Norwegian Shipowners Organization, he initiated the Thor Heyerdahl International Maritime Environmental Award to be given for improvement of the global environment. Thousands of volunteers in every U.S. state and territory as well as in more than fifty other countries pick up tons of marine debris each fall in a one-day coastal cleanup. The Ocean Conservancy, which organizes the annual cleanup, collects data on the debris to determine sources of pollution. The most common item washed up on the shoreline? Cigarette butts and filters—a total of 1,640,614 were picked up in 2001. Volunteers also found 259 entangled animals, most snared in nylon fishing line. what about trash and chemicals that go in the sea?? ?